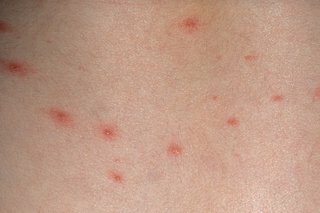 Chickenpox starts with red spots, they can appear anywhere on the body. The spots fill with fluid and the blisters may burst. They might spread or stay in a small area.The spots scab over. More blisters might appear while others scab over. 1. Chickenpox starts with red spots. They can appear anywhere on the body. Chickenpox is very itchy and can make children feel miserable, even if they don’t have many spots. Chickenpox is usually much worse in adults. 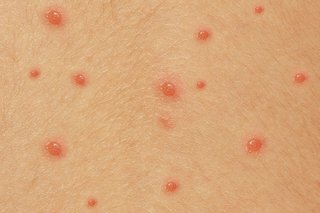 If you or your child has Chickenpox, you’ll need to stay away from school, nursery or work until all the spots have crusted over. This is usually 5 days after the spots first appeared. Tell the receptionist you think it’s chickenpox before going in. They may recommend a special appointment time if other patients are at risk. 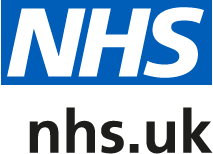 In these situations, your GP can prescribe medicine to prevent complications. You need to take it within 24 hours of the spots coming out.